Once we had had breakfast this morning, we headed off to the canal bikes. I only found out yesterday that the 'canal bikes' were water bikes. When I chose to do this as an optional, I thought we were just push biking around the canals. Not that it bothered me though, I was more excited about them being on water anyway. There were meant to be about 30 of us doing this activity, but after last night only 9 people turned up! There were 4 in one boat, 3 in another, and then just me and Stacey in the third boat, so we didn't have anyone to swap with if we got tired. The boat people had packed a little picnic for us too, to eat along the way. We had a map to follow, which we were pretty confused about to begin with, since we were following river paths and not roads. We were also pretty terrible to begin with too, and were worried about getting run over by a big boat. The rules of the canals are the same as the road - stick to the right, and all boats have right of way over our little paddle boats. We couldn't stick to the right though, and we were all over the place, and then we started to panic when a bigger boat came because we couldn't get to the side. A couple of times we just started to turn in circles. Eventually though, we got it sorted - Stacey did the steering, because I was useless, and I was the main peddler and map reader. Aren't we a great team haha. We finished up after about an hour, right by the Anne Frank house. The queue was quite long so we decided that we'd go back to the hotel and buy tickets online tonight for tomorrow. We also decided that we were finally going to do a hop on hop off bus, which we had already planned to do twice in other cities. We literally just missed the bus for another 55 minutes, so we went to a little cafe which was next to the Anne Frank house and had delicious bagels. I was pretty excited about the bagels because they're so hard to get back home. It took quite a long time for our bagels to arrive, so we ended up having to run to catch the hop on hop off bus, but we got it on time luckily. We did about 3 quarters of a loop and then we got off at the Amsterdam Dungeon. We ended up buying some combined tickets for the Dungeon and the Ice Bar, which we'll do tomorrow. The Amsterdam Dungeon was good and very similar to the London one. They said everything in Dutch and then English, so that was good. They had people from the crowd come up in each room, and I got called up at one point. I was on trial. 2 people before me had been on 'trial' too, one for being a witch and one for a crime in fashion, and then when it was my turn, I was guilty for being a New Zealander. She just asked me where I was from and that was it, I was guilty. When we were finished at the Dungeon, we went back to where we had gotten on the hop on hop off bus, but we couldn't find the actual bus stop. We were in the same spot, but there was no sign down the street. So we sort of just stood there for a while hoping that one would come and we could wave it down, which we kind of did in the end, but I still don't know where the stop was. We carried on on the bus for a few more stops and then we got off up by the train station to try and find our coach pickup point. We couldn't figure out where we were meant to meet because we both thought we were meeting in 2 different points and we weren't going to know which was the right spot until the pickup time, which by then would be too late if we were at the wrong one. So luckily we knew how to get back to the hotel on the tram, and we just decided to do that. Even though we left the same time as we were meant to meet the coach, we got back to the hotel about 40 minutes before them, so we were pleased we did that. After this, we needed to get ready for our canal cruise and dinner at the Sea Palace. I also tried to book tickets for the Anne Frank House online, but they were all sold out! I was so annoyed. So tomorrow we're going to have to line up to go in anyway. We all got into our nice gears and then we were off again for the last time ever in the coach. 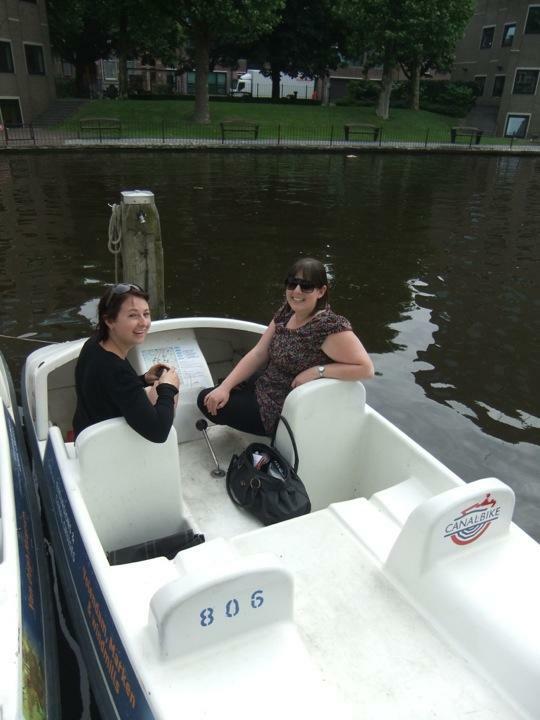 We jumped in the canal cruise boat and all took a seat at some chairs and tables. We all got 2 drinks each and we spent about an hour just cruising the canals and spending our last few hours together. I thought it was going to start raining at one point, but luckily that passed, because we were out in the open. The canal boat took us to the Sea Palace restaurant which we were having our last group dinner at. It was a big Asian restaurant serving a banquet. Some of it was good and some pretty average. After dinner we began on a pub crawl. The first place we went to, all I was concerned about was going to the toilet before everyone left and moved to the next pub, but the queue was huge and we had to pay. Then some people said they were going next door to Burger King to use the toilets for free. So by the time we got over there, a bunch of people had already gone in and so one of the Burger King attendants decided to stand on the door and charge 50 cents. We said well we've only got a note, so did he have any change. But of course he didn't have any because he had just decided to stand there and charge us. So we turned around to walk away and he said we could go in and then get change down at the counter. So afterwards Stacey went down to buy a drink and get some change and then came back up to pay, and the original man was gone, so she tried to give it to another attendant and he said no you don't have to pay. So the other guy obviously just saw a way of making a quick buck but decided once we didn't have any money to just let us go anyway. We walked to the next bar which was a shot bar. They just had about 50+ shots on the menu. Because there were 2 Contiki groups there, 100 or so people, and it was a tiny bar, it took forever to get a drink. We stood in line for about 15 minutes and then just as we got to the front, someone ordered a shot which they set on fire, so we got told to stand back, obviously so that we wouldn't catch on fire, and once he was finished with the flame, another guy had managed to make his way in front of us. So that was another 5 minute wait. Once we finally got to the counter, I ordered a 'fresh kiwi' purely for its name, I had no idea what was in it. I thought it was going to be a shot, but it looked more like a Jaeger bomb, but I'm not sure. Once we had our drinks, it was time for the toilet again. This time we basically had to climb a ladder to get upstairs. They were so steep and I though how the hell are drunk people expected to go up and down these! Again we had to pay 50 cents which really annoyed me when we were paying customers. I think that's really rude. It's times like this which definitely make me realise why I don't like clubbing much anymore! And it also made me feel less guilty for not going out partying on so many nights on Contiki, or feeling like I had missed out by not going out. After this we decided to leave, neither of us could be bothered going to the next 2 pubs, plus we wanted to go back and sort our suitcases etc for tomorrow. We were going to get a taxi, but we thought we were close to the tram station that we needed to catch the tram from (the only station that we knew how to get the tram from), so we decided to walk and then tram back to the hotel. One hour later... We finally got to the tram stop! We didn't realise it was so far away. So by then our feet were really sore and blistered, and we should've just got a taxi. It was a nice walk though at that time of night. There was heaps happening and it didn't feel unsafe. So we finally got back to the hotel and sorted our bags, etc. We're allowed to sleep in tomorrow and don't have to check out with Contiki, but we want to get up to say goodbye to everyone since it's the last day. 20 days has gone so quickly. Plus we'll get woken up by the other two, and we want to get going at a reasonable time to get on with our last day in Amsterdam. We need to get a taxi to our new hostel in the morning to drop off our bags before heading off on our day. Then we're going to head to the Anne Frank house first before going to the bagel cafe for lunch again, as well as the Van Gogh museum and the Ice Bar.